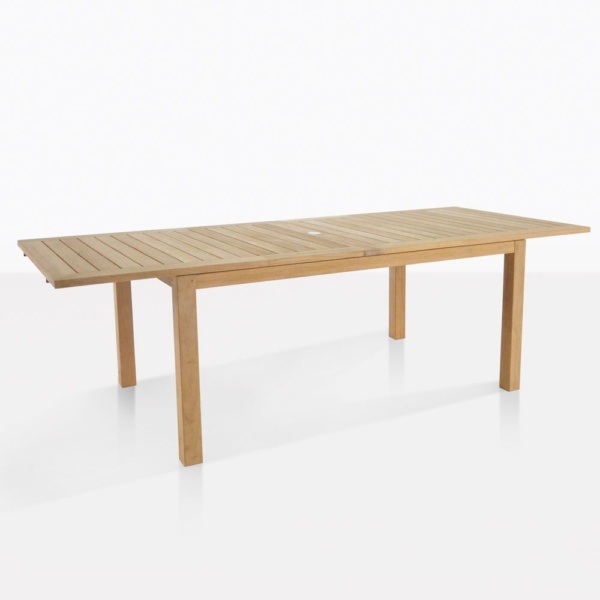 Neat, dignified, classic… our SS Monaco Extension Table is the no-fuss, suitably stylish approach to extension tables! 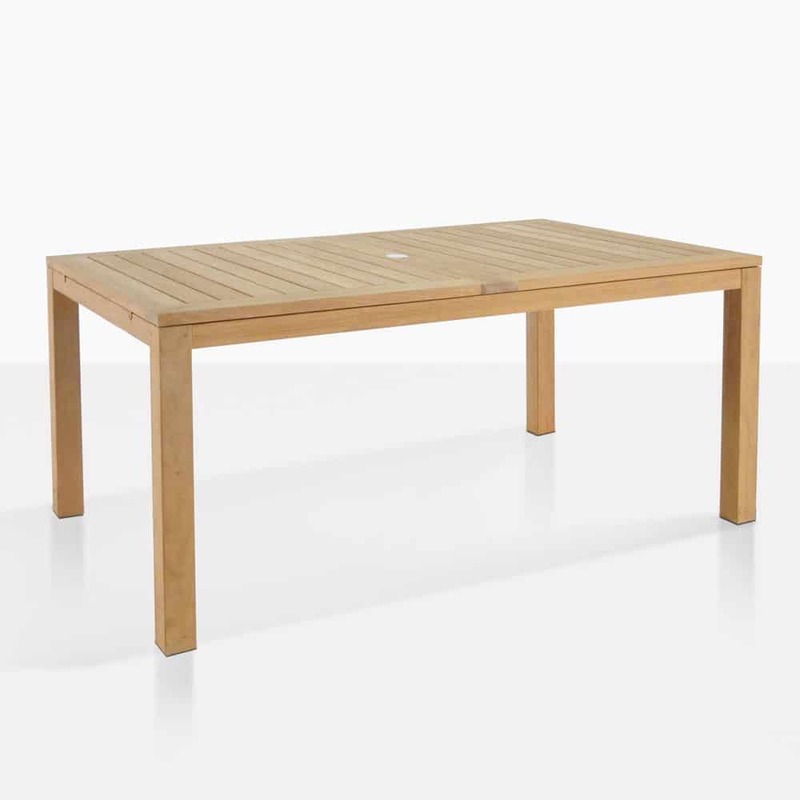 The SS Monaco Extension Table expands from 64″ to 79″ to 94″ – the perfect size for quiet family dinners or more rambunctious parties! Exposing gorgeous tightly placed slats of teak on the table top and just a hint of stainless steel, this table has a double leaf extension that seats up to 10 people! 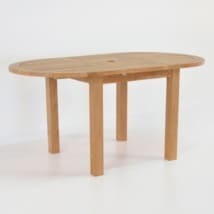 This is perfect with any of our teak dining arm or side chairs, and includes an umbrella hole! L64" > L79" > L94" x W39" x H29"
Have a beautiful stone patio that is screaming for an elegant table so you may enjoy the tranquility and comfort of your surroundings? Look no further! 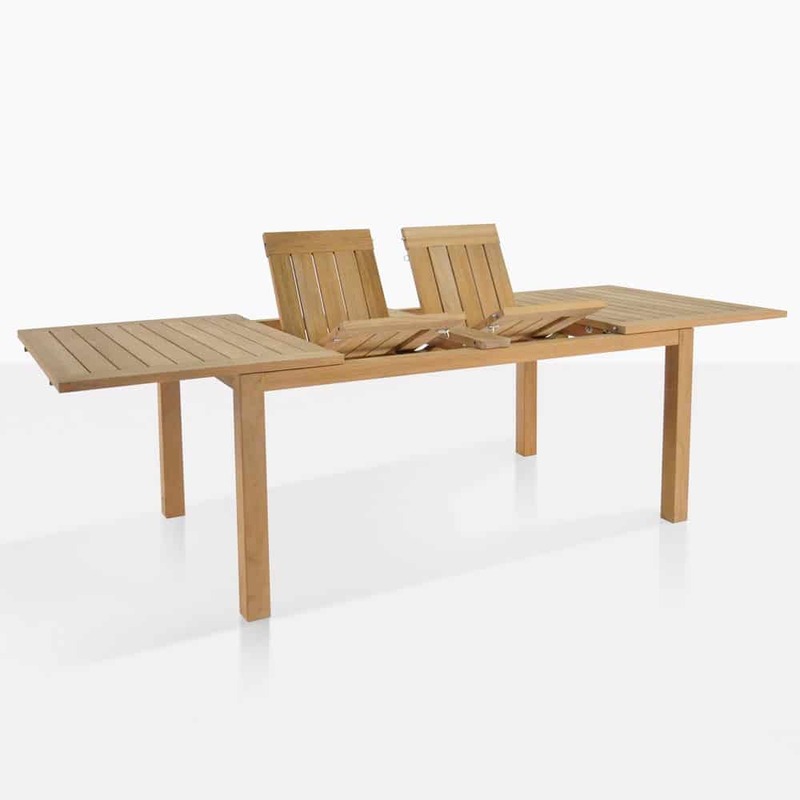 Add 6-10 Summer Stackers in Taupe to your SS Monaco Extension Table for a stunning and modern dining set! Perhaps you have a verandah overlooking a magnificent view? Set up your table with 8 our the new Nautical Dining Chairs for a luxurious East Coast look. 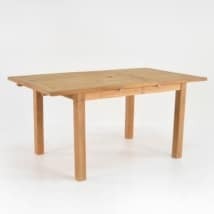 This table is simple enough to pair with many styles of chairs or benches. Try a Modern Raw Bench on either side and Square Raw Concrete Stool on either end for a uniformly industrial look, or experiment with different wicker styles for added texture! The SS Monaco Extension Table is made from quality A-Grade Teak, a product highly sought after for its natural oil and rubber content, meaning it will last for years and years to come! The Stainless Steel is #316 Marine Grade, which wont rust or corrode over time. Have a question? Call up! 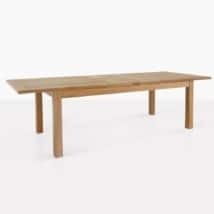 At Teak Warehouse, we are available 7 days a week to assist you with your furniture needs!